Senior Kyle Lutinski prepares to shoot during a March 30 nailbiter versus Salem State University. It’s been an uphill battle for the Spartans. Since we last checked in, Castleton has played five games. In that span, the team has gone 1-4, blowing out Anna Maria 11-3, but falling to Plattsburgh, UMass-Dartmouth, Sage and most recently, Salem State. Their overall record now sits at an uninspiring 2-7. Yet, the Spartans remain undeterred. At the halfway point of their season, the Spartans overall record may seem discouraging, but their conference record sits at a salvageable 0-2. With hope still alive, the Spartans are focusing on ways to improve their approach. McDougall has a point. The Spartans last three losses have been decided by just one goal. They fell to both UMass-Dartmouth and Sage 8-7 and 4-3 to Salem State. The Spartans recent results are indicative of a competitive team that is just a step away from putting it all together. Although the desired results have not been met, McDougall insists he’s pleased with the hard work his team has put in. 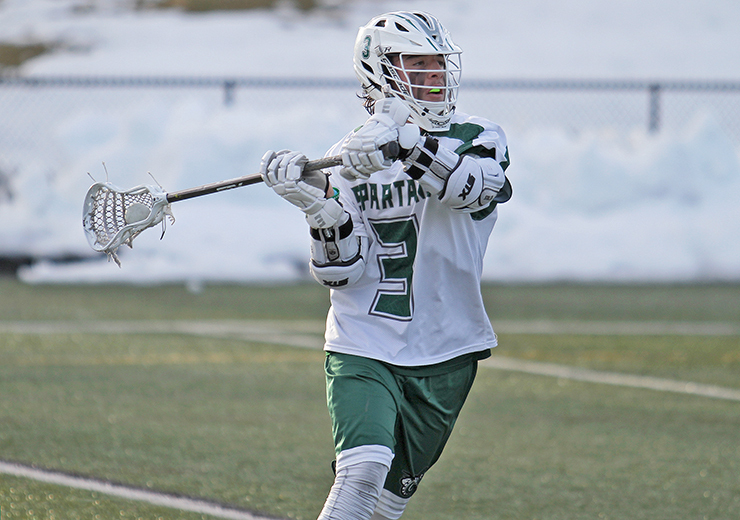 On a more positive note, senior midfield Jason Sedell notched his 100th career goal in the Spartans loss to Sage. He joined elite company as one of just eight players in program history to reach this milestone. The Spartans will return to action Wednesday, April 3 to take on UMass-Boston before entering a three-game stretch of conference matchups at home. “While we haven’t had the results we’ve wanted in the past few weeks, there’s still a lot of lacrosse left to be played,” McDougall said.